This episode of our series on “Henry Norris at the Arsenal” is by far the longest, and the most contentious and complex piece in our tale. I hope have made the story clear, but if you are prone to take the occasional glass of fine wine and it is a suitable time of day that you are reading this, that might help get through the convolutions of this month’s events. We are, as I am sure you will know, approaching the end of our tale. Arsenal had also had a rocky start to the FA Cup so far this season, despite the focus resulting from it being obvious that the FA Cup was the only competition that Arsenal had any chance of winning. In January Arsenal had beaten Sheffield United away 3-2 in the third round and then drawing 2-2 away to Port Vale. The replay against Port Vale was held at Highbury on the afternoon of 2 February; Charlie Buchan scored and Arsenal won 1-0. With Lady Edith out of hospital Sir Henry was at his home with his wife and so obviously not at the game. Had he been at the game, and had he stayed after the match to discuss matters, things might have turned out differently, for at this game a row broke out between Herbert Chapman and the Arsenal trainer. According to Tom Whittaker (and remember Whittaker was hardly an unbiased observer, being a junior member of staff, but one who could, and indeed did, benefit from an upheaval in Arsenal’s support staff), “Arsenal were pressing hard, but things were not going just right and old George Hardy’s eyes spotted [Hardy was 49 at the time] something he felt could be corrected to help the attack. During the next lull in the game he hopped to the touchline, and cupping his hands, yelled out that one of the forwards was to play a little farther upfield.” Chapman, Whittaker goes on to suggest, was furious and sent Hardy to the dressing-room. Now showing us at once how unreliable reports like this can be we have a very different point of view reported from the Times. Their match report noted that Jimmy Brain kept straying offside. Sally Davis adds that from her reading reading of the reports it was a habit of his, mentioned on other occasions in the Islington Gazette. So one report has Hardy trying to get the forward to play further upfield, the other says that Brain was getting caught too far upfield, and this was a regular habit. Either someone has got it wrong, or the situation was more complex. One issue to remember is that we are still only 18 months on from the change in the off-side law, and if you have been reading my commentaries for last season, you’ll know how many bizarre and unexpected high-scoring results there were, of the type rarely seen under the previous law. The implication is that clubs were still trying all sorts of ways of making the most of the change. And I believe one of these changes was for some centre forwards to push up deliberately run the risk of getting caught offside until the moment comes when he holds back, finally staying onside and thus beating the offside trap, taking the opposition defence unawares and running through with only the keeper to beat. Indeed I am sure from watching Thierry Henry in all his years at Arsenal, he himself was not averse to this tactic. To try and unravel this further, let’s consider Jimmy Brain. First we need to recognise that during his 204 league game career with Arsenal he scored an amazing 125 goals. He was recruited by Knighton, and in Brain’s first season of 1924/5 he played mostly at inside right scoring 12 in 28. My point in mentioned inside right being that the inside right tended to be more deep lying that the centre forward even before the change in the offside rule. Brain missed the first game of the 1925/6 season under Chapman but thereafter played every single league and cup game. In 41 league games he scored 34 goals. Now this is not the achievement of a man who didn’t know how to avoid getting caught offside. Chapman had also used Brain as an inside right for a run of six games in the first half of the 1926/7 season but still Brain had scored 18 goals up to 1 January. None of this looks to me like a man who might be unable to avoid an offside trap. So, we know about Brain and see him as a profoundly talented centre forward with experience of playing inside right. We know of Chapman as a manager who had won the league twice in recent years and taken Arsenal to their highest position ever in the league. So now to conclude this part of the story we must turn to Hardy. And here we have a huge problem because we know so little about him. Hardy was born in Newcastle-on-Tyne, on 20 February 1877, and was an amateur athlete until an industrial accident at the saw mill where he worked on 25 January 1905 meant he could no longer see through his left eye. He then spent four years as an assistant trainer at Newcastle United before moving to Woolwich Arsenal in 1910. Quite how this move to Arsenal happened I don’t know. We know at the end of season 1909/10, just before William Hall and Henry Norris offered to help Woolwich Arsenal FC, the club’s first-team coach resigned. George Hardy was taken on as his replacement. What we don’t know is who appointed George Hardy, why he chose Hardy, why Hardy left Newcastle or any other details of the case. Certainly Hardy could not have left Newcastle because Newcastle was failing – Newcastle had won the league in 1905, 1907 and 1909 and the FA Cup in 1910. Why go from a club that was winning everything in sight, to a club that had not only won nothing but was also on the very edge of going out of business? Indeed if Hardy had simply had a disagreement over training methods or tactics or anything else at Newcastle, he would surely have had his pick of clubs. The move is odd. It also seems unlikely that the Woolwich Arsenal board before Norris took over would have offered Hardy a good contract (or indeed any contract) since they were on the edge of bankruptcy. Likewise the new regime in Arsenal would hardly have been able to offer a package to Hardy that would have been of interest to Hardy to entice him away. Sally Davis says that George Hardy was the first employee appointed by Hall and Norris’ regime at the club. And Arsenal needed a trainer, but how come it was a man associated with such a successful club? The only reason I can find is that something went awry between Newcastle and Hardy, and he simply wanted a job – preferably a job for which no one else with experience was likely to apply. Woolwich Arsenal met the requirement. Henry Norris would most likely have offered Hardly a very modest salary, even in making Hardy the first team trainer, quite possibly suggesting he could get part time work in one of the factories. Sally Davis makes the point that by 1927, because of his long association with Arsenal and his appointment by Norris, Hardy was therefore a “Norris man.” But we must also note that Sir Henry fought Whittaker’s case against the FA, and encouraged (or at the very least accepted Chapman’s recommendation of encouraging) Whittaker’s training in modern methods of overcoming injuries.. But one way or another Hardy became established at Arsenal, and we hear of him in the first game at Highbury carrying off George Jobey who was injured, and taking Jobey to his own home for treatment, as the dressing rooms had not been built yet. We also hear of Robert Benson who played for Arsenal in a wartime game in 1915 but collapsed during the game and died “in the arms of the Arsenal trainer, George Hardy,” as most reports put it. As far as I can tell both tales were given to the press by Hardy in interviews, and another possibility is that Hardy was a great story teller with the ear of the journalists. Either way, there are reasons to wonder a little about Hardy, his expertise and the veracity of his stories. Whatever the reason Chapman was furious about Hardy coaching from the touchline and a row broke out. With Sir Henry Norris absent, William Hall and Samuel Hill-Wood became involved and as vice-chairman of Arsenal, William Hall decided, quite reasonably that this was an issue for Chapman to decide. The other long-serving director, Jack Humble, was seemingly not involved – he may not have been at the midweek game if he was then at work. George Hardy apparently then apologised, but Chapman would have none of it and demoted Hardy to trainer of the second team, while seemingly promoting Whittaker to being trainer of the first team. This may well have been something that Chapman wanted to do anyway, since as has been made clear in earlier episodes, Chapman had become very interested in the training Whittaker had been undertaking in the use mild shocks in the treatment of injuries and reducing the time taken for recovery. It then appears that when Sir Henry returned to the club, possibly the next day, there was quite a contretemps between Sir Henry and William Hall which in turn led to Hall’s resignation from the board. Although Hall and Sir Henry had worked together with Arsenal since 1910, they had for many years been going in separate directions, with Hall deeply involved with the Football League, and Sir Henry increasingly absent from the club initially through his own illness, and now that of his wife. But this leaves the question: why was Hardy so strongly disciplined for one misdemeanor? Sally Davis suggests that the event brought into the open something that had been simmering for some time: who ran Arsenal and was in effect a power grab by Chapman. Davis also reports that when Chapman was first appointed he had immediately wanted to demote or remove Hardy, whose methods he considered out-dated but Sir Henry would not allow it. So if it is true that Hall allowed Chapman to decide what happened to Hardy in Sir Henry’s absence, the issue now became a direct challenge to Sir Henry – although it was one that presumably Hall felt he was entitled to take, given that he was the senior director present. And we must now also remember the issue of the cheque for £170 for the second team bus, on which Sir Henry had forged Chapman’s signature, was also simmering. And as we are now going to tackle this whole affair head on I think it is worth briefly summarising some of the issues at this time which are penitent to the story but which are generally ignored. Let us initially consider Sir Henry Norris, and his way of working. 1: We know that in many ways Norris had always been an entrepreneur and a fixer as all the most successful businessmen of the era were. He had gambled that there would be an insatiable desire for small houses on the edges of London to provide homes for the ever growing number of people working in the city of London effectively running the Empire. He gambled also that he could make house building profitable by building a small road, selling 80% of the houses to regain the costs, and renting out the remaining 20%. A simple but incredibly successful plan. In such a world Norris fixed problems. As when in 1910 he took over Arsenal, saw the list of debts, agreed to settle them, and then found that at least one sizeable debt (the architects bill for work on the Manor Ground) was not included. He paid that, and in that way gained himself an architect friend for life. 2. As did so many other businessmen, Norris ran his own wholesale company which allowed him to buy goods at trade prices. This was obviously legitimate for the building company. I think he also put through some products for Arsenal – he certainly said this in court – and I believe the bus went through in this way and then given over to Arsenal. Since the wholesale company was owned by Sir Henry Norris and not Arsenal, when the bus was sold by Arsenal, the money was clearly due back to Sir Henry. That looks to me to be the reason why he took the cheque for the sale of the bus money as his own. Now that does not excuse the forging of the signature; that was silly and clumsy, and may have come from arrogance, being used to having everything done his way, or the on set of a lack of clear thinking in old age. But within the act of forging the cheque there is the issue of intent. Was Sir Henry’s intent to defraud the club of its rightful money? I think not – and more reasons why are given below. Besides the forging was so flagrant and bound to be discovered at once, that it could hardly have been meant to be secretive. 3. Sir Henry was clearly owed money by Arsenal – not just for the bus, but also for the Buchan bonus payments. Quite why Sir Henry was paying these personally I have no idea, but it may have had something to do with the maximum wage regulations. However obviously everyone knew about the payments – that was a central part of the plan; to have a scheme that would get massive publicity. And the League did nothing about them, other than change the regulations in 1926 to stop any other club trying the same trick. 4. Sir Henry instructed the club to take the £170 out of his account (although we don’t know which account) for the bus, which shows there was no intention of fraud. Indeed by and large, people who commit fraud don’t openly admit the fact even before the accusations start flying. 5. My final point is a supposition. Sir Henry had had a house built in France and was living there more and more. His wife had now been taken very ill and would also benefit from the warm weather in the south of France as she recuperated. To arrange all these matters Sir Henry would need a bank account in France. Maybe that is where the bulk of his money now was, and his own account was running low – not because he didn’t have the money, but because the money was in the wrong place. Indeed even the story that went around at the end of the season (that Arsenal had had to pay more for Buchan by using the £100 a goal arrangement than they would have done on paying the original fee) was part of the publicity. It was untrue, but as far as I can see no one at Arsenal ever contradicted it. Sir Henry might even had started it himself. But what of Chapman? Chapman was the man who was under pressure before the affair of the cheque started. After two years as manager of the most unfashionable champions ever (even more unfashionable than Burnley) Chapman had then taken Arsenal (so nearly relegated for the last two seasons) to second place in the League. Yet this season they had slipped. Transfer fees had increased by results had seriously declined. Then the Hardy affair, with what certainly seems now to be a massive over-reaction (and a punishment that no employer would get away with today). And yes Chapman had every reason to be annoyed that Sir Henry had forged Chapman’s signature, but Chapman had not lost anything. No one accused him of illicitly trying to get hold of the money, and everyone was always going to be able to see where the money went (which is one of my reasons for thinking that there was no intention of fraud on Sir Henry’s part – just a rather foolish attempt at a short cut. So was Chapman being hyper-sensitive by making this a major issue even though no one ever pointed the finger at him? I think the answer is yes, when we remember that in 1920 he was banned from football for life because of the actions of the Leeds City board. Also we know that Chapman resigned from Leeds City in 1919 before the case of the illegal payments was made by the League against the club. Why, we don’t know, but maybe in 1927 Chapman could see himself becoming immersed in another scandal, and so reacted very strongly to that. We do know that in April 1929 Chapman resigned from Arsenal because results were not going the way he wanted. The board on that occasion refused to accept his resignation. But he seems a man who despite the calm exterior that he has since been portrayed as having, could act very emotionally. But back to the main theme. The issue of the bus cheque can only be explained by incorporating the fact that Sir Henry had instructed the club to take £170 out of his account for the bus. And we can have seen that he was also personally paying money to Buchan for his payment per goal arrangement for 1925/6. This is looking as if the club had had a significant cash flow problem over time, such that Sir Henry paid for the bus personally himself, whenever it was bought (I would guess in 1919), and was having to pay the bonus payments. Of course Arsenal had just undertaken to buy Highbury and this again would put quite a strain on the club’s financial resources. At this point I suspect that even if Arsenal were to release the minutes of board meetings, any meeting around this time would have been highly sanitised, not least since board minutes are normally cleared by the chairman of a company before being presented to the rest of the board for approval. With Hall having resigned and Humble seemingly not involved, I suspect they give nothing but a line or two of a statement. However the ramifications were not yet over because with Whittaker continuing to be first team trainer with Chapman’s blessing against Sir Henry’s wishes, Sir Henry had in fact been outmaneuvered, and in his own letter of resignation from the board just five months later Sir Henry said that his position as chairman was now untenable because of the challenges to his authority by Hall and Chapman. Tottenham had in fact just rid themselves of both their manager and first team trainer, and if we look at their recent results we can see why. Between 20 November 1926 and 12 February 1927 Tottenham played 14 league games and one FA Cup game. Nine league games and the FA Cup tie were lost. Three games were drawn and only two were won. In the 14 league games Tottenham conceded 33 goals. I’m not sure if Tottenham really wanted Hardy, or in fact they just wanted a new face in to steady the ship. Hardy later moved on to coach Tottenham’s nursery side Northfleet United and he died preparing for a Tottenham match v West Bromwich Albion in January 1947. And at the core of all this turmoil was a fourth round FA Cup replay on 2 February in which the result was Arsenal 1 Port Vale 0. And so, moving on… it has been my personal experience in running a number of modest sized businesses through my life (most of the time, several at once) that crises are inevitable. But also that most reasonably well-run businesses can cope with a crisis. What most firm find hard to cope with however is two totally different crises at once, and this is what Arsenal faced now because on 4 February Herbert Chapman arranged for photographs to be taken of the £170 cheque for the bus – quite possibly not knowing that instruction had already been given for the club to receive £170 out of Sir Henry’s personal account. It appears that because of the Hardy affair, and I would suspect because of Chapman’s experience with the board at Leeds City, relationships between Sir Henry and Chapman had now broken down, and Chapman was not going to listen to a story about the bus being owned by Sir Henry’s wholesale company. But the date is telling; he was ready to fight Sir Henry and indeed Chapman would also have known that on 5 February Sir Henry was going to travel with the Arsenal team to Liverpool for the match at Anfield. And it seems that on the journey Chapman reported to Sir Henry his account of the battle between Chapman and Hardy. It also appears that Sir Henry told Chapman that Chapman had exceeded his authority in demoting Hardy until the end of the season, the rules of the club saying he could only demote someone until the next board meeting took up the issue and resolved it. This is actually quite a common approach to running a business where the day to day manager is a member of the board only by virtue of his position as a manager. It allows the manager to keep the business operating, and to deal with emergencies, but it gives the board the ability then to step in as soon as a meeting can be convened of enough board members to make the meeting quorate. Chapman had, beyond doubt, exceeded his authority, and such action as he took was potentially a sackable offence, since it couldn’t now be undone (Hardy having left the club). The 5 February game away to Liverpool was also interesting, beyond the brewing fight between Chapman and Sir Henry, in that following Arsenal’s victory over Port Vale on 2 February, it was now known that Arsenal would be playing Liverpool again at Highbury in the 5th round of the cup on 19 February. Buchan was rested for the match, and Lambert, who had not been playing of late, took his place. This league game was thus a trial run for the Cup match. As for the game, the Times referred to “comic incidents in the mud” although I doubt that either Sir Henry or Chapman were amused. Arsenal lost 3-0. Inevitably, given that Hardy was by now in negotiations with Tottenham, or possibly had resigned and started work there, the demotion of Hardy was upheld by Sir Henry and the board, and the promotion of Tom Whittaker to first team coach was also upheld, and so that matter was for the moment put to rest. But of course still resting in the background was the forged signature on the cheque (a technical act of fraud) and around this time William Hall as the second most powerful man on the board, was told about the situation. I imagine he was told by Sir Henry Norris, who presumably realised that he was going to need to get his explanation across one way or another, and doing it on the front foot (rather than in response to accusations coming from elsewhere) was the best approach. On 10 February Arsenal played Leicester City away, and lost again – this time 1-2. Blyth (another member of the Cup squad) was now dropped and Peel given a game. Brain got the goal. Two days later Arsenal played again on 12 February, at home to Leeds United, and finally, after two defeats and a draw got a victory. Milne and Barley came in as half backs giving John and Baker a rest, and Arsenal won 1-0 with a goal from Buchan. This was John Barley’s first game for the club – having signed on 21 October 1925. However he never really made progress at Highbury and on 3 May 1929 transferred to Reading after just eight first team games with Arsenal. Harper came back into goal as Daniel Lewis got his first cap in an international. He played three times for Wales between 1927 and 1929. The following day, 13 February, Hall rang Sir Henry to ask for a meeting urgently. It took place later than day and at the meeting Hall told Norris that some people within Fulham FC now knew about the forged signature of the bus sale cheque. Worse, John Dean, the chairman of Fulham FC, was now saying he would go to the FA to ask for an enquiry into the matter. 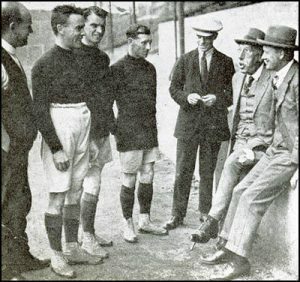 As noted there was a huge amount of enmity between Sir Henry and the Fulham board, not least over the London Victory Cup match in March 1919, in which Sir Henry felt Fulham had not only flagrantly cheated in the game but also conned the London Combination into hearing an appeal against the result without telling him that the appeal was to be heard! There were also other battles that went right back to 1910, with criticism being leveled at Henry Norris and William Hall as Fulham directors about everything from team selection to using club funds to give money to charities, and their growing involvement with the bankrupt Woolwich Arsenal (although there was of course no allegation about Henry Norris using anyone’s money except his own). Now those long festering arguments, and quite possibly downright hatred, came to the fore. Hall’s view was that this was a battle that Sir Henry could not win, and so he urged Sir Henry to resign as a director of Arsenal. (Sir Henry would, in such a case still be a shareholder, but no longer the man pulling the strings of the club he had rescued in 1910 and spent 17 years rebuilding.) But Sir Henry was never a quitter and refused to resign. On 14 or 17 February there was a board meeting of Arsenal attended by the full board and Herbert Chapman. (As ever we don’t have access to the minutes of the board unfortunately, only details as later given by Sir Henry at the enquiry into this affair. Working from memory, and perhaps his diary, Sir Henry gave these two different dates for the meeting on different occasions. No one from Arsenal with access to the minutes seems to have bothered to correct the record. This may well have been simply a regular meeting of the board, already planned, but now of course it was dominated by the forging of the signature on the bus sale cheque – although I suspect issues relating to the row between Chapman and Hardy and Chapman’s actions taken without board approval were also presumably on the agenda. William Hall repeated his earlier conversation with Sir Henry, and thus brought the cheque issue to the fore. Chapman told the meeting that he’d handed the cheque to Norris in July 1926, and had had no further involvement with the affair until January 1927. Hall now resigned from the board formally, having told Sir Henry he would do so if Sir Henry himself did not back down. However he agreed not to make a public statement about the matter, for the good of the club in terms of player stability. What we don’t know of course is what explanation Sir Henry gave both for forging the signature and paying the cheque into his wife’s account. Nor why he was personally paying at least one installment of the money owed to Buchan. Looking back at Sir Henry’s time with Arsenal since 1910 I suspect he had been in the habit of using his money to keep Arsenal afloat quite regularly. We know he personally paid off all the club’s debs in 1910, and he paid for some of the building of Highbury, although mostly he personally guaranteed the loans. No one else is ever recorded as supporting the finances of the club, and yet now after 17 years there was an argument over an act which while clearly illegal had not cost the club a penny. Sir Henry later reported that relationships between himself and Chapman now broke down completely – and here again we don’t know if this was due to the cheque (it was Chapman’s signature that was forged) or the Hardy / Whittaker affair. Or both. Certainly Chapman had exceeded his authority totally in that affair which put his judgement in doubt, as much as Sir Henry’s judgement was put in doubt by his forging the signature. But now another curiosity emerges – and it is one that I think does give us further insight into what was going on. Arsenal FC had been paying the chauffeurs of both Sir Henry and William Hall for some time. I don’t know when this started; it could have been any time between 1910 and 1927, but I suspect it came about once the debts of the club were being cleared. This was not allowed under the rules of the League, and would come out if the FA called for detailed audited accounts of the club to be handed over. Yet bizarrely William Hall then stated that he had no knowledge of the arrangement – which is odd. Someone was paying for his chauffeur, and as a director Hall ought to have been aware who. It just seems too odd that a man who had been involved as a partner in the whole building enterprise in Fulham and the rescue of Arsenal in 1910, could never once had wondered who was paying his chauffeur. In fact in seems the two chauffeurs started to be paid as employees by the club on 4 June 1921, and Sir Henry said in an affidavit in 1927 that this arrangement finished on 5 May 1923, although in a 1929 statement he said the date was 5 May 1924; I suspect the second statement was a simple slip while working from memory. Sir Henry’s explanation was that by mid-1921 he could not walk very well – this information turned up in an affidavit by Charles Crisp who in 1921 was a director of the club. The arrangement came to an end on 5 May 1923 according to the statement made by Sir Henry in 1927, because Leslie Knighton, the manager at the time discovered the payment and was unhappy about it. At this stage one can see Arsenal as a company in financial chaos with no proper records being kept, or a company run by two long-term friends and business partners who trusted each other totally, and who knew that neither would do anything untoward against the other. What I think happened was that quickly arranged practices that were acceptable when trying to solve the problems of the club in 1910 after Arsenal’s backer dropped out, were being used with a much bigger and now profitable enterprise. Meanwhile of course the football waited for no man nor his scandals and next up there was the 5th round cup match which Arsenal won against Liverpool at Highbury on 19 February 2-0. Buchan and Brain got the goals in front of 43,000. Harper played in goal, but otherwise it was the “cup team” throughout. Now around this time Harry Peters, the long serving office manager at Arsenal FC presented the note Norris said he had written and given to him in early July 1926, authorising Peters to debit Norris’ bank account with the £170 for the sale of the Arsenal reserve team bus. This action clearly suggests that the money for the bus went to Sir Henry (as everyone now knew), and Sir Henry had given instruction for the money from his account to be given to Arsenal. Again, this only makes sense if indeed the bus had been bought originally by Sir Henry through his wholesale company, and so the money for the bus had to go to him, and then he would pass it onto the club. On the same day George Hardy was coach for the first time at Tottenham, which Tottenham won. Writing about Hardy’s change of employer, St Ivel, in the Islington Gazette said that his decision to leave Arsenal would have surprised many who were not involved with Arsenal, but St Ivel’s understanding was that Hardy had gone as a direct result of a disagreement with Chapman. This tumultuous month now had one game left to play, on 26 February it was Arsenal against Burnley. Burnley were 4th in the league and Arsenal 12th, Burnley being just three points behind the league leaders, Huddersfield. Their away form was not sensational, but it was above average – 3 wins, 4 draws, 7 defeats. Arsenal’s home form of 8 wins, 5 draws and 2 defeats was better, suggesting that Arsenal might just get a win it, although with only five teams having scored fewer goals than Arsenal before the game there were no hopes for a lot of goals. Thus no one was prepared for the match 26 February 1927 which ended Arsenal 6 Burnley 2. Hopefully everyone enjoyed the game, as it was the last victory for a while as Arsenal then suffered six consecutive league defeats in which the club let in 26 goals. But in this game Brain got four, Buchan and Hoar got the other goals. Here are the results for perhaps the most tumultuous of all months in the history of Arsenal since the summer of 1910. During the month Chapman, as we have seen, had had two huge rows – one with his trainer, one with his chairman, both of which had gone to board level – the first because he exceeded his authority, the second of which because it was his signature that was forged. Indeed Sir Henry, in a later report, said that from here on, Chapman was rude and abrupt towards him. Maybe Chapman had cause – or at least thought he had cause – to take such a stand, but it is quite possible that having these battles was having an effect on the well being of the team. As we shall see in the next episode. Details of the whole series of articles on Henry Norris at the Arsenal can be found here including a selection of articles covering the election of Arsenal in 1919 – which is a topic that is still seemingly considered contentious in some quarters despite all the evidence to the contrary.